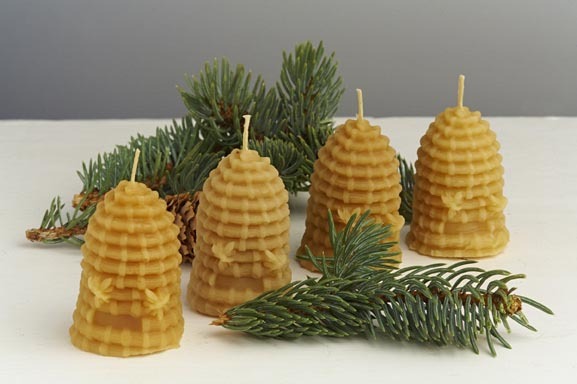 Handmade pure 100% beeswax candles in the shape of the old time skep beehive. The candles are hand made by me the beekeeper and are made from the pure beeswax produced by the bees. They measure approx 7 cms high and 4.5 cms at the base. They have a cotton wick and will burn for approx 5 hours if the wick is trimmed correctly and the candle is kept away from drafts. Colours may differ due to wax collected from different hives and age of comb. Hypo-allergenic, benefit those with environmental allergies, sensitivities, and asthma. The only candle that emits negative ions to purify, cleanse, improve air quality, and invigorate the body. It is estimated that the bees must fly 150,000 miles to collect enough nectar to produce six pounds of honey just to secrete one pound of wax. And for every 100 pounds of honey harvested, the beekeeper can only obtain about 1-2 pounds of the beeswax. A candle safety notice will be included in the package. 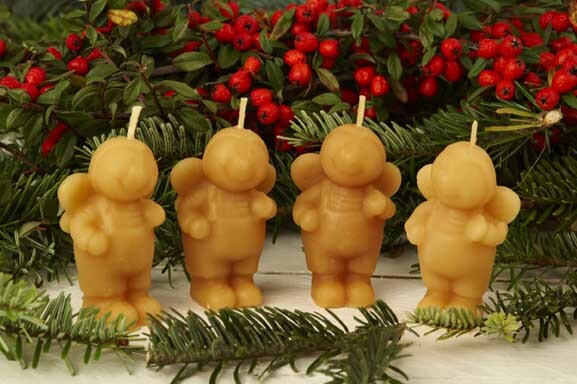 These candles would make a great gift. Made from beeswax produced by the bees in my hives. Surplus to their requirements. Add to honey order.